North Carolina offers a variety of biking options, from flat, easy rides along scenic beaches to rugged climbs up steep mountain trails. North Carolina offers a variety of biking options, from flat, easy rides along scenic beaches to rugged climbs up steep mountain trails. Whatever your mood and level of comfort on a bike, we've got a route to match. Here’s a list of 10 bike trails ranked from leisurely rides to steep, perilous climbs. A flat bike route in the North Carolina mountains might seem unlikely, but the gentle trail along the south fork of the New River in Ashe County is perfect for those wanting a leisurely pedal through the country. The route, which follows Railroad Grade Road, is extremely level and easy to ride. Views from the route include the river, lush pastoral settings and Christmas tree farms. Before turning around, stop in at the Todd Mercantile, noted for its fresh-baked cinnamon rolls, local mountain-crafted merchandise, live music and contra dances. Bike rentals are available at RiverGirl Fishing Company. 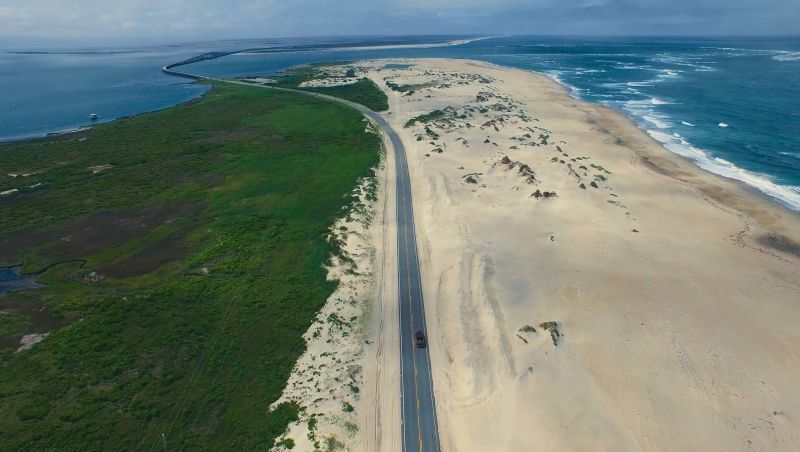 This stunning 25-mile coastal bike route runs along N.C. Highway 12, the only major road on quiet Hatteras Island. “Major” is a relative term here, though – much of the ride is uninterrupted by a single house, billboard or convenience store. Instead, you’ll see the ocean to one side and the Pamlico Sound to the other. Your ultimate destination is the only high rise on the island: the historic Cape Hatteras Lighthouse, built more than 130 years ago to warn ships away from the treacherous Diamond Shoals. If your legs aren’t too tired, climb to the top for epic views. N.C. 12 on the northern Outer Banks is a bit hillier than on Hatteras, making this route just a touch more challenging. Fortunately, the shoulders and sidewalks along here are particularly bike-friendly. For much of the ride, you’ll enjoy views of Currituck Sound, but don’t pass up the opportunity to duck down side roads on the ocean side for views of the surf and lovely beach houses. Since the distance between Duck and Sanderling Resort is only about 5 miles, you might want to continue north to Corolla, where you could be lucky enough to spot wild horses on the beach. North Carolina’s Sandhills area is a land of towering longleaf pines, elegant homes and horse farms, and more than 40 golf courses, including nine at the world-famous Pinehurst Resort alone. A nice cycling route starts in Southern Pines, where you can explore the charming town easily on bike, then get on Midland Road and head toward Pinehurst. This scenic byway, once a train spur, is beautifully graded and makes for smooth cruising. The village of Pinehurst is as charming as Southern Pines, so tool around downtown before heading into the resort. This route begins at historic Bennett Place, the spot of the largest troop surrender of the Civil War. Duke Forest offers more than 30 miles of road for biking, as well as 3.4 miles of prepared surface trail that winds through the woods around the Duke University Golf Course. While you’re in the area, ride through the beautiful, bike-friendly Duke University campus. North Carolina 8 & 89 near Hanging Rock State Park is a somewhat challenging but rewardingly scenic ride. As you start south toward Danbury, the road begins to climb and twist along the side of the hill, offering views of rustic log houses and old tobacco barns. Traffic is minimal, but watch out for sharp curves. The big payoff of this route comes when you reach Sizemore Road and have a great view of Hanging Rock to the right. You’ll understand how it got its name when you get a glimpse of the masses of rock that appear to be hanging off the side of the mountain. Biking along any part of the Blue Ridge Parkway is a treat, but this particular portion, which dramatically snakes around mountainsides and seems to float magically above Linn Cove, is heavenly. As you begin the route at Julian Price Memorial Park, prepare for a slow, gradual 7-mile ascent. As you’re working your way up the slope, check out the distant peaks of Grandfather Mountain – you’ll find plenty of overlooks along the way in case you need to stop to catch your breath (or just want to enjoy the view a little longer). Perhaps the most interesting part of this trip comes when you cross the viaduct itself – the sensation is like riding on air. Turn around at Lost Cove Cliffs and enjoy the easy, downhill pedal back. This ride is relatively short at 10 miles, but it packs a major thigh-burning (and visual) wallop. Because Cashiers is perched atop a plateau encircled by Nantahala National Forest, you get awe-inspiring vistas at every turn. Tall mountain peaks, deep valleys, waterfalls and lush forests will be your view for this gorgeous ride. Start your ride at Cashiers Commons on U.S. 64 then turn right onto North Carolina 107. Get ready for some heart-pounding climbs and hairpin turns, which are suited to cyclists with mountain biking experience. Look for a great view of Cashiers Lake to your left once you hit North Carolina 107. The Tsali Trails in Nantahala National Forest are a series of mountain biking trails offering plenty of heart-pounding action for off-road enthusiasts. The trail comprises more than 40 miles of hilly trails broken up into several loops, each with varying degrees of difficulty. Right Loop, marked as more difficult, offers lots of hilly interior riding with a few creek crossings and access to the Windy Gap Overlook. The moderate Thompson Loop offers fewer obstacles, though the ride is still quite hilly. This grueling, 12.9-mile route in Pisgah National Forest features ascents over at least eight water bars, a series of rock steps called Satan’s Staircase, a harrowing ride through a rhododendron tunnel and a track so narrow it’s not much wider than a bike tire. The payoff? Besides an adrenaline rush, you’ll also get stunning views of Looking Glass Rock. With difficult climbs and breakneck descents, this is not a route for beginners, but experienced mountain bikers will find many thrills here.